Samosas are little pastries with a savoury filling. They are typically fried, but I’m not a big fan of frying at home, so I opted for a baked version. There are also different forms and folding techniques, so you don’t have to necessary stick to the one I’ve used, but if you want to, I’ve included a little video of how I folded them below. 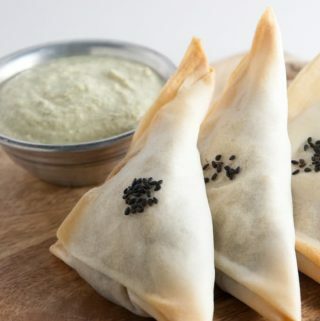 The black sesame seeds are completely optional, but if you want to make samosas with different fillings, you can mark them with black and/or white sesame seeds or sunflower seeds, so you’ll know which ones are which. 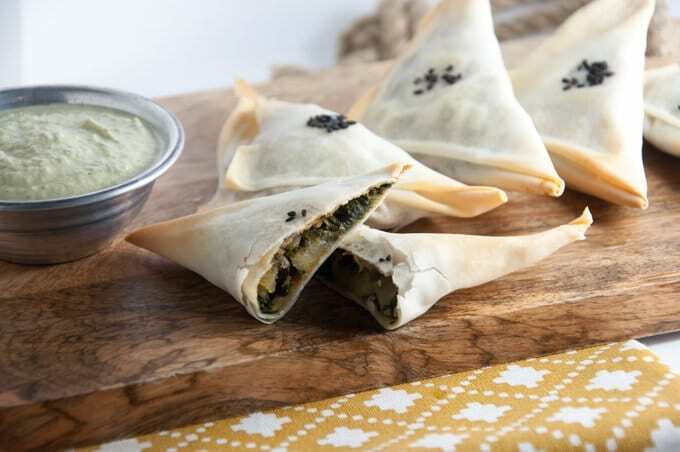 I filled my baked samosas with potatoes and spinach – classic combo. I made a little video to show how the samosas were folded. It’s kind of difficult to explain with words, so seeing it will hopefully clear things up. I’ve served them with this vegan Cilantro Lemon Sunflower Seed Dip and the combination was exceptional. I can only recommend making that dip as well! Recipe for vegan, baked Samosas filled with potatoes and spinach. Spring Roll Wrappers are used for the samosas and they are a served with a creamy Cilantro Lemon Dip. Put the chopped potatoes in a large saucepan and add about 3/4 cup of water. Let it cook on medium heat (lid on the pan) until the potatoes are soft and the water has evaporated. If the potatoes are not soft enough and the water is gone, add more water and let it cook further. Once the potatoes are soft, add the olive oil and chopped onions. Let it cook until the onions are golden-brownish. Reduce the heat and add the fresh spinach. Once the spinach wilted, season the filling with salt and curry powder. Let the filling cool off before filling them in the wrappers! Prepare your work station. 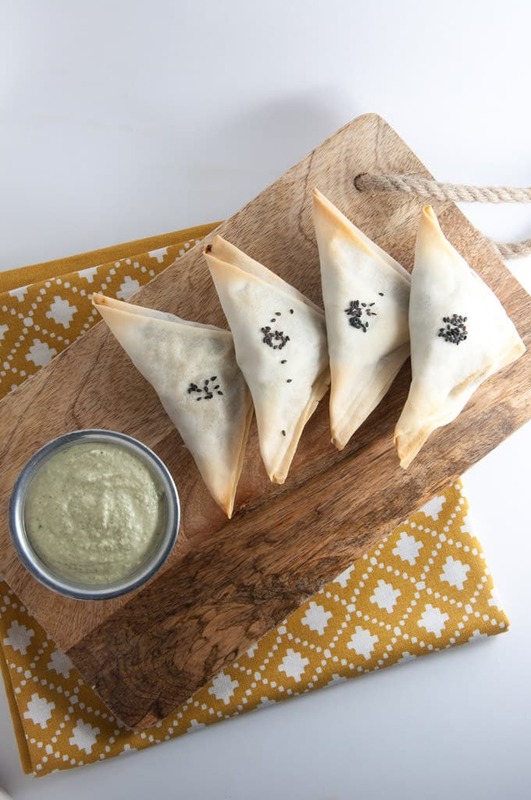 You'll need the spring roll wrappers, a small bowl with water and the filling, olive oil for brushing the samosas, black sesame seeds (optional) and the baking sheet. 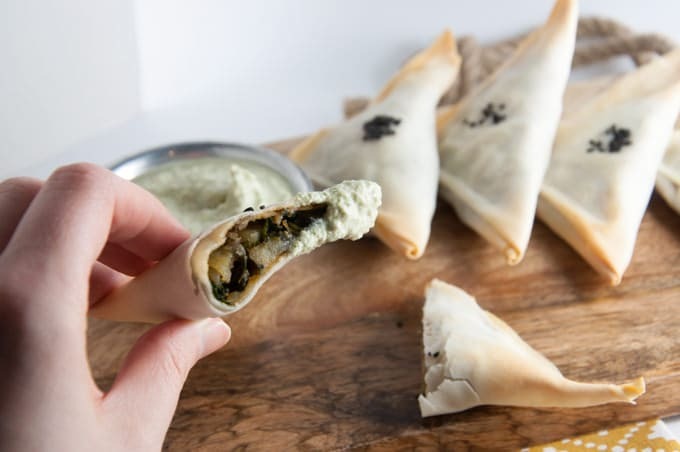 Brush the samosas with olive oil, add the black sesame seeds on top and bake them in the oven for about 15 to 20 minutes - until the sides are golden and crispy. Serve with a homemade Cilantro Lemon Dip, for example, and enjoy. *Make sure they're vegan. I've used frozen Spring Roll Wrappers and kept them in a damp towel when thawing to prevent them from getting too dry. 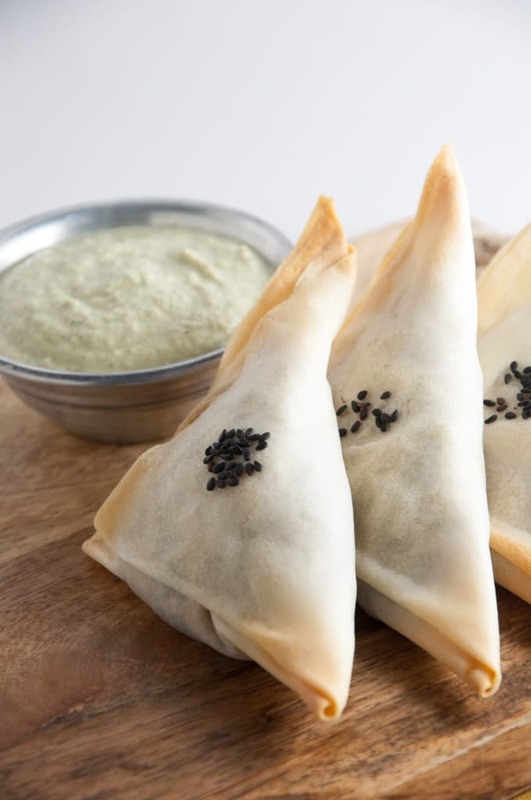 **If you make samosas with different fillings, you can mark them with black and white sesame seeds. Oh, that’s interesting – I’ve never used rice paper for baked or fried rolls – sounds intriguing though :D Although I’ve used rice paper to wrap schnitzel to create an awesome crispy “skin” and it was amazing, so I can only imagine how good baked and fried summer rolls must be :) I hope you’ll like these baked samosas! I really like the baked version a lot, crispy edges for the win! Thank you, Kyra! I’m glad you liked the video. :) Puff pastry for samosas sounds good too! I actually have another recipe coming up, which uses the same filling but in combination with puff pastry and it’s really yummy. We do have an Asian store just around the corner, so I love introducing more and more asian products into my diet. Thanks for posting, I’ll keep you updated on how they turned out. I just made this recipe using phyllo pastry since i couldn’t find spring roll wrappers. I must say they dont look as pretty as yours yet they are delicious! Cant wait to make them again using the proper wrappers!! Thanks for posting this great and easy recipe! The spring roll wrapper in my grocery have eggs. I checked Whole Foods as well…same result. Where can I purchase vegan spring roll wraopers? The first spring roll wrappers I had in my hands were vegan, so I figured they all were. Too bad they’re not. I bought the brand “Spring Home” and had their TYJ Spring Roll Pastry (here’s how they look: http://amzn.to/2dkOn6T ) They have different kinds and sizes. The ingredients should be: Wheat Flour (48%), Water, Coconut Oil, Salt. I want to make this but could not find spring roll wrappers only egg roll wrappers.. will this be OK? Do you think you could freeze them?! Also.. Are they good reheated? Thanks! My son is vegan and I’d love to make these for him when he visits next week end. Do you also have a recipe for the cilantro dip you mentioned or another suggestion, since I’m a carnivore (!) ?